1. 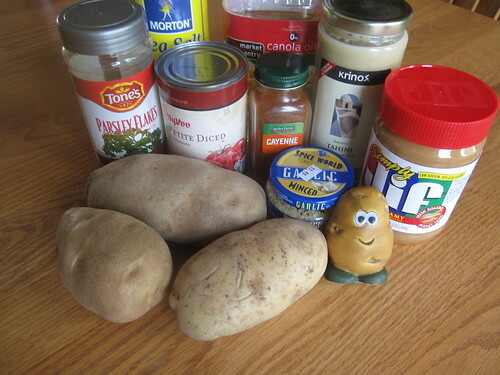 Scrub potatoes. If they are not organic, peel them. If they are, just cut out any bad spots. Dice the potatoes into 1/2 inch cubes. 2. 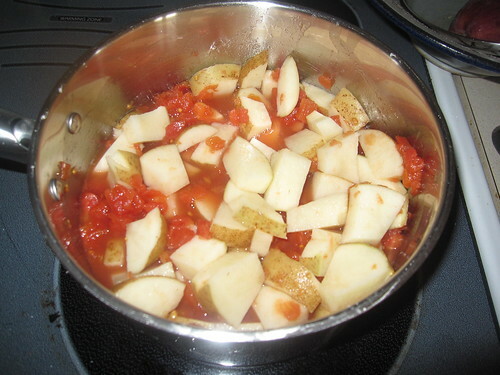 In a medium pot, add the potatoes, tomatoes with the juice, water, and salt. Cover and bring to a boil over medium-high heat, then turn heat down to medium low so the mixture just barely boils. 3. 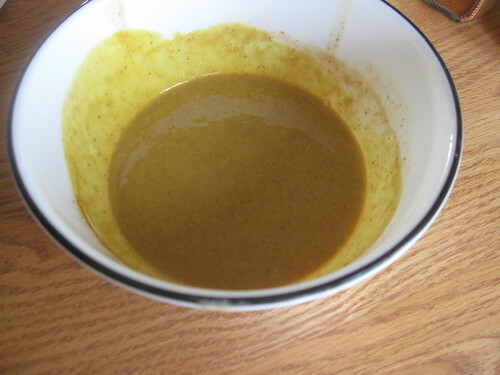 In a small microwave-proof bowl, combine the vegetable oil, tahini, peanut butter, and chipotle or cayenne pepper. Put garlic through a garlic press or mince it very fine. Stir the garlic into tahini mixture. Cover bowl and microwave on medium-high for about 2 minutes, until the mixture is fragrant. 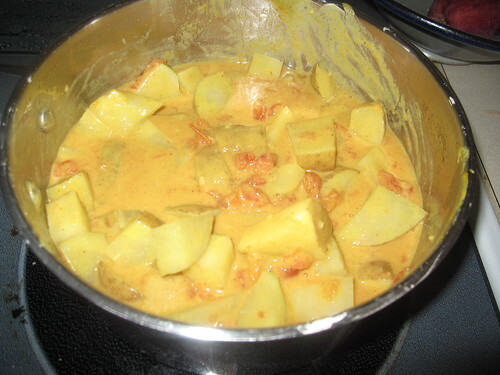 Stir in the turmeric, then add the tahini mixture to the potato mixture. 4. Simmer for about 10 minutes, until the potatoes are tender. Garnish with chopped parsley. Tahini is a paste of ground sesame seeds and is far and away the most expensive element of this meal. Honestly, I had never heard of it before I attempted this recipe, but I figured, “Why not be experimental?” The only jar we could find at nearby grocery stores cost almost $7 and we used only a small portion of it, which isn’t exactly a value proposition. Thankfully, we do like this recipe and we intend to make it again. Really, not much commentary needed. 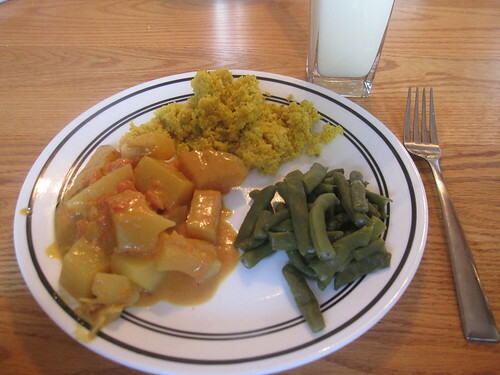 We served it with some leftover couscous and some green beans straight out of our garden, simply because they were nutritional sides that were right on hand. Did we like it? My wife and I really liked the dish – we both ate it hungrily and had seconds. Neither of our young children seemed to like it at all, though. Our total cost was somewhere near $11, with most of the cost coming directly from the tahini, which you can find in the Asian food section of a well-stocked grocery store. We had enough leftovers for all four of us to eat it as leftovers again for lunch two days later, so it makes plenty. This recipe was inexpensive and straightforward enough that I wouldn’t modify anything at all. Having said that, though, people might not want to drop $7 on tahini – understandable for an ingredient used in such small quantities. If you decide to skip it, substitute two more tablespoons of peanut butter for it. The curry will definitely have a stronger peanut flavor, but it’ll be substantially less expensive and still quite delicious. I would definitely recommend a green vegetable as a side dish with this, however. We found the fresh green beans were a very nice complement.